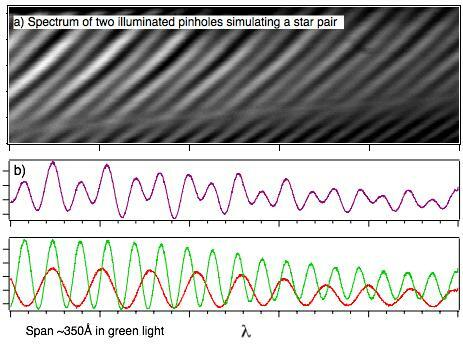 Another potential application of EDI is the accurate measurement of the angular difference between two or more stars, in spite of large drifts in the interferometer pathlength. The measurement of stellar angular positions is called astrometry, and is an alternative method of detecting the wobble of an exoplanet on a star. Here the interferometer is a long baseline interferometer, where starlight is collected from two paths that are separated transversely, so that different stellar angles causes different delays between the two paths. In the conventional long baseline interferometry method dispersion into many wavelength channels is not used, and thus the interferometer is used close to its zero delay position, and only a single star can be observed at a time. The chief engineering difficulty is that unwanted thermal or mechanical changes in the apparatus can change the interferometer delay-- and this mimics an angular change. And so one must keep the apparatus extremely rigid, and the angular precision is directly limited by whatever pathlength stability that can be achieved. The EDI technique can be thought of as a way measuring a white light fringe to very high precision, and to do it with an interferometer delay that is not near zero. Our measurement of Doppler velocities of 1 m/s scale correspond to fringe shift precisions of 1/15,000 of a wave. Because the light is dispersed into a spectrum, two stars at different angles create two distinguishable spectral patterns. Hence we can measure multiple stars simultaneously, and the light can as much as possible take a common path and be recorded on a common detector. In this way any unwanted path length drifts affect all starlight signals equally, so it is a differential measurement that is extremely robust to apparatus pathlength changes. The angle of a star relative to the interferometer baseline is proportional to the "pitch" of the fringe comb it creates in the spectrograph, ie. the number of fringes along a given bandwidth, if the interferometer is followed by a spectrograph. Panel (a) is the fringing spectra of two pinholes across the room seen through the "long" baseline interferometer (pictured on this page). Panel (b) is a lineout along the dispersion direction of panel (a). There are 8 beats between the two different spatial frequencies along the dispersion direction. Panel (d) is after the pathlength offset is deliberately changed (as if the apparatus angle was changed). Both spatial frequencies have increased, but the number of beats, 8, remains the same. This illustrates the great robustness of this technique to unwanted pathlength changes.